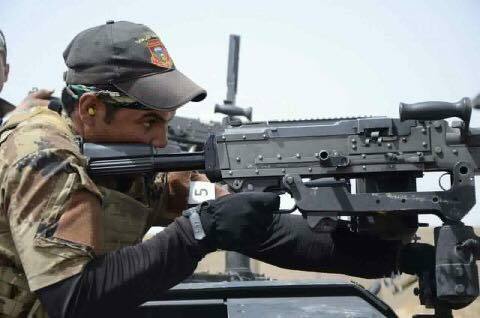 Editor’s note: This is the third part in a series examining the arms and equipment employed by the Iraqi Special Operations Forces, in light of the prominent role played by this unit in recent fighting. Part 1 (personal equipment) is available here and Part 2 (precision rifles) is available here. 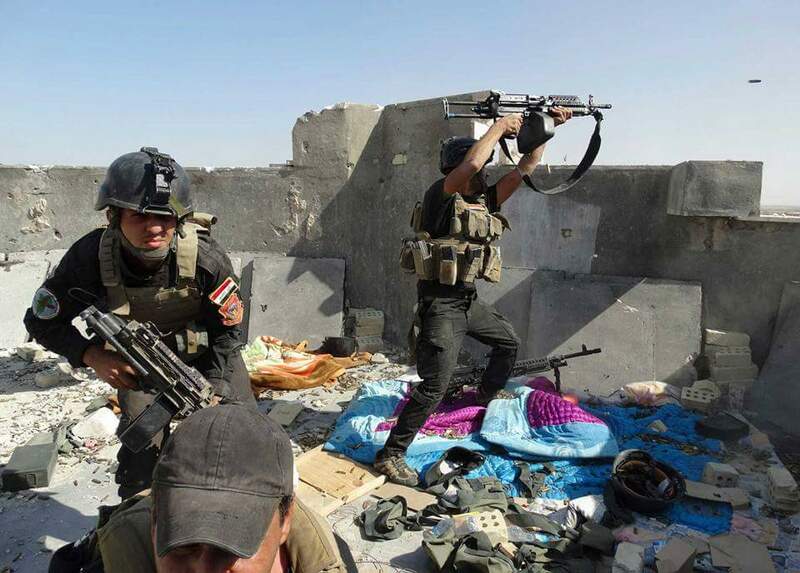 Due to the nature of the operations undertaken by Iraqi Special Operations Forces (ISOF) fighting in built-up urban areas (including the cities of Mosul, Fallujah, and Ramadi) against a constantly manoeuvring insurgency, the force has shown a strong reliance on man- and crew-portable support weapons at every level in the unit’s organisation. A significant number of light, general-purpose, and heavy machine guns are used. From the 5.56 × 45 mm M249 Squad Automatic Weapons (SAW) and 7.62 × 51 mm M240 general-purpose machine guns (GPMG) carried by dismounted squads to .50 BMG (12.7 x 99 mm) M2 and 12.7 × 108 mm DShKM heavy machine guns (HMG) mounted on the up-armoured M123 HMMWVs that the force relies on, machine guns of all types have played a crucial role in the recent fighting that ISOF has participated in. An important feature of ISOF clearance operations is the force’s heavy reliance on vehicles and dismounted teams that operate from them. This is necessary because the vehicles provide an essential base of fire from which the dismounts can manoeuvre. In addition, they also provide an important casualty evacuation system that is readily accessible at the frontline. ISOF operators routinely use their vehicles as a base of operations, as a mobile store for their food, water, and ammunition. Movements are coordinated through these vehicles supporting advancing operations. This has led to two critical drawbacks of working in dense urban areas. Vehicles provide an ample target of opportunity for the SVBIEDs used in quantity by the Islamic State (IS). At the height of the battle in Mosul, IS forces were employing up to a dozen SVBIEDs per day against Iraqi and Kurdish forces. Operating in conjunction with small commercial off-the-shelf UAVs to guide them, the suicide attackers could work their vehicles through the maze of streets and engage clusters of ISOF vehicles, or even semi-mobile command centres. The heavy reliance on vehicles also requires a robust ability to sustain them, requiring a substantial logistics chain ensuring an adequate flow of spare parts and repair technicians. Unfortunately, these are capabilities that much of the Iraqi security forces is still sorely lacking. This is further compounded by the locally-produced armour that is attached to the vehicles, in many cases overburdening them and exceeding the carriage loads that they were designed for. US and allied forces experience similar challenges in responding to ever-larger IEDs early on in Operation Iraqi Freedom, eventually switching vehicle systems to MRAPs and later MAT-Vs that were specifically designed with heavy armour and C-IED requirements in mind. At the team or squad level, the majority of light machine guns carried by ISOF have been M249 SAW types. ISOF received M249 models early on in the organization’s development, with the US providing in-depth armorer classes at least as far back as 2009. During this time ISOF were supplied with the MK 46 Mod 0, an M249 variant initially developed for the United States Special Operations Command (USSOCOM) and used extensively by the 75th Ranger Regiment. These are readily identifiable by the four M1913 Picatinny rail segments on the fore-end, short 16.3-inch barrel, and a ventilated handguard. 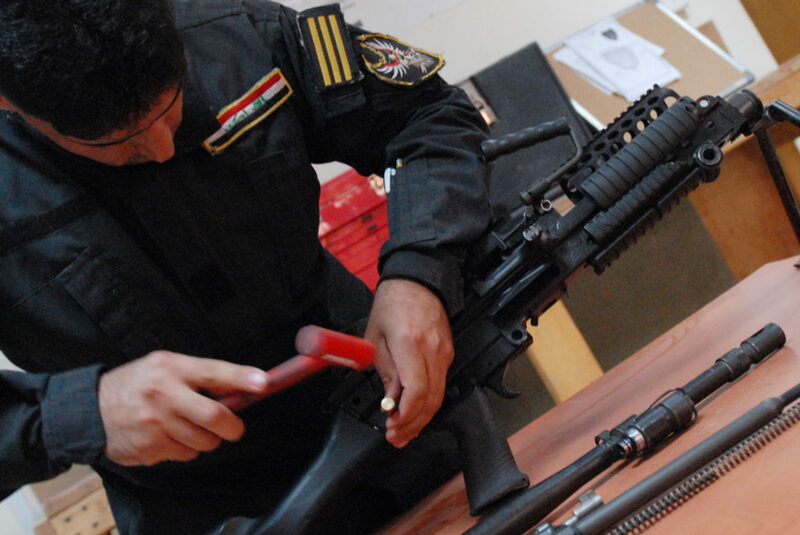 Almost invariably, when documented in ISOF use these light machine guns are fitted with 200-round plastic belt boxes instead of the 100-round soft pack commonly seen in use with US forces. Some come with the telescoping ‘Para’ stock but the majority are fitted the standard and fixed M249 stock. Rarer yet but still in limited service are the more recently-developed “PEO Soldier” type telescoping buttstock that first became available on the US military’s M240 Lima variant. A version is available for the M249, and ARES has documented a handful of these in service with ISOF. 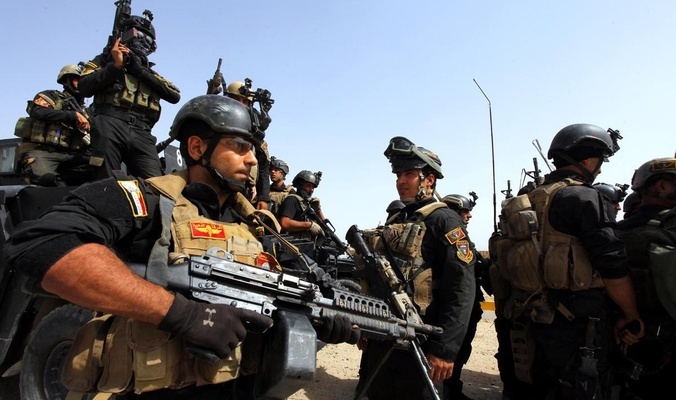 In years past, some ISOF units issued sidearms and even M4 series self-loading rifles to operators that carried light machine guns, but this doesn’t appear to be the case today, with a single operator typically only armed with a light machine gun. A photograph from the battle of Mosul in which two M249 gunners are employing their light machine guns, with a MK 46 Mod 0 on the right. Both weapons have “Para” telescoping buttstocks. Note the lack of spare 200-round belts boxes or even pouches for them on the gear that the fighters are wearing. Instead, we see STANAG pouches for their personal M4s or for reserve ammunition for other members in their squad. laying on the ground is an M240 with telescoping “PEO” type buttstock. Examining the rooftop position scattered with fired cartridge cases, blankets, and assorted gear, it is likely this ISOF team has at least spent the night in this firing position, a typical tactic that ARES observed throughout ISOF participation in the battle of Mosul. 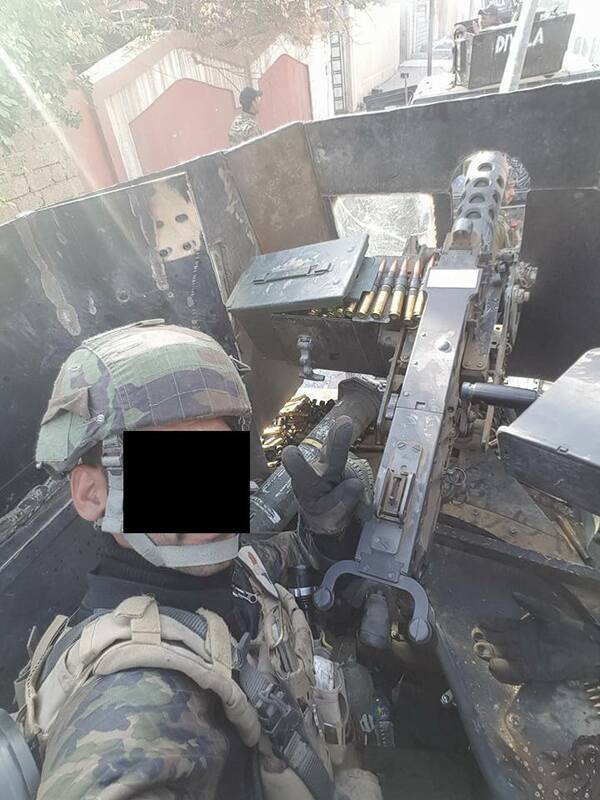 Some of these originally-issued machine guns are still in ISOF armouries today, but many have been superseded by recently-supplied standard configuration M249 models with 20-inch barrels. At least two variants are in service; an earlier type with the Picatinny optics rail installed on the feed tray cover and an older, slab-sided handguard, and a newer variant with a handguard that has 3 Picatinny rail segments attached to provide for aiming devices and grips. Unlike the holographic sights, AN/PEQ-2 aiming devices, and vertical foregrips which are fitted to the M4 series self-loading rifles in service with the rest of the force, light machine guns in use by ISOF generally employ none of these accessories. Slings employed with the M249 are often of the 2-point variety, or none at all. ISOF operators that employ light machine guns in combat are often seen only with magazine pouches suited for 5.56 × 45 mm STANAG magazines, and without pouches that could fit spare 200-round plastic belt boxes. Spare belt boxes are typically located in a team’s vehicle, thus necessitating a trip back to the vehicle to resupply. The spare STANAG pouches appear to benefit other ISOF members in a team when they run low on ammunition. This also ensures a designated M249 gunner has the ability to leave his light machine gun in the vehicle and pick up an M4 if more appropriate; perhaps when clearing a particular building, for example. 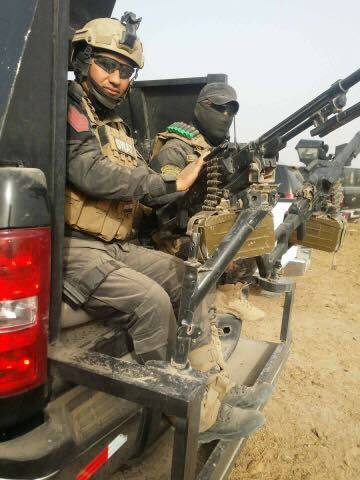 The M249 is occasionally seen mounted to ISOF vehicles. This ISOF photograph shows both a MK 46 Mod 0, at the lower left, and a standard M249 with 20-inch barrel. Both have 200-round belt boxes attached to their light machine guns. Another M249 is also seen. It would appear this is an ISOF dismounted team planning an operation. Fourteen men are pictured here with what looks like a captain (3 pips on the shoulder bar) pointing at the ground. For a conventional US Marine infantry squad, this number of light machine guns is typical, but for an ISOF squad, this is more than typically observed during a dismounted operation. 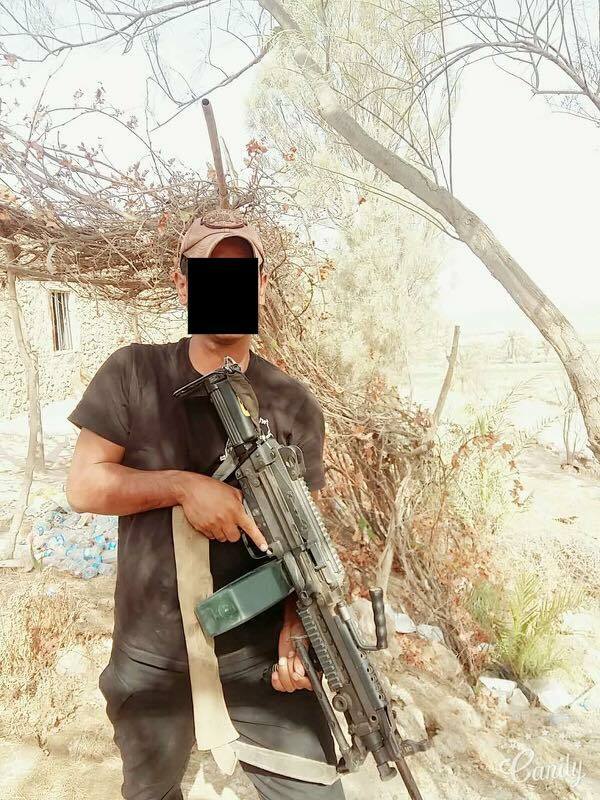 This ISOF operator has the “PEO” type telescoping stock fitted to his standard M249 with 20-inch barrel. 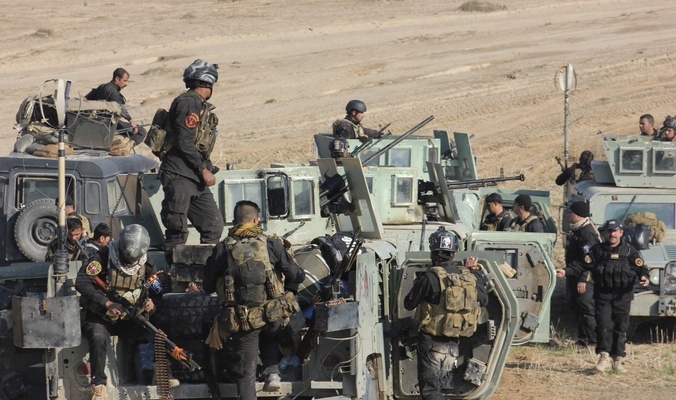 Note that the belt box is green instead of the black typically seen amongst ISOF units. This operator has a two-point sling mounted to his light machine gun, with an oversized shoulder pad to compensate for the weight of the M249. Although much less common than the M249, the 7.62 x 51 mm M240 GPMG is also employed at the squad level. There isn’t a GPMG billet position within ISOF squads; instead, the force has the option to take the M240 GPMG from the truck to be used in a dismounted role if required. This is usually based upon the needs of the team, and appears to be particularly common when setting up bases of fire on top of buildings, for example. The M240 is even more dependent on proximity to vehicles for resupply and is frequently used as a mounted weapon. Both the M249 and M240 are most commonly mounted to the “Bucket” or troop-carrying variants of the HMMWV where ISOF metal fabricators have fitted machine gun pintle mounts various locations, often including the rear of the vehicle. Although this could give a single HMMWV a tremendous base of fire in all directions, it is rare that all of these positions are used at the same time; the force mostly opts for the standard “Gun Truck” variant approach, with a single turret mount and gunner. When employed in the dismounted role the M240 is almost never used with soft pack attachments. Instead, belts of ammunition are carried along with the weapon. This M240 GPMG is mounted on top of a troop-carrying HMWWV. Note the “PEO” type telescoping buttstock that is mounted in place of the standard fiberglass version. 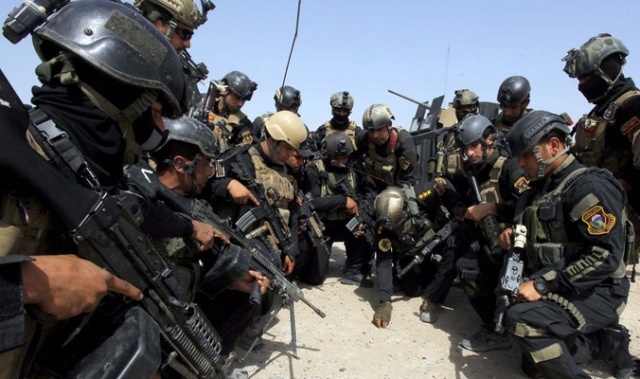 ISOF operators before mounting up for a mission. Note the M240 GPMG held by the man third from left. It still is in its pintle mount that will likely be attached to a pintle in a troop-carrying HMWWV. The M240 gunner still carries double STANAG magazine pouches, indicating that his M4 rifle is close at hand and available for dismount use. Two operators on the left have helicopter safety cords attached to their belts. Although ISOF has largely moved away from the heliborne role, the safety cords are reminiscent of it and are seen by some as a status symbol. For the “Gun Truck” role, the majority of ISOF HMMWVs use the .50 BMG M2 HMG mounted in the turret. There have been some instances in which 12.7 x 108 mm DShKM type HMGs have been documented in place of the M2, but this is quite rare. Even rarer is the use of M240 GPMGs in gun truck turrets, as these are usually confined to the troop-carrying truck role. Whilst the M2 is a very formidable heavy machine gun, it is not without its faults – especially among untrained shooters. It requires attention to detail in order to diagnose and rectify malfunctions. More importantly, the older models require the headspace and timing to be “set” every time the gun is reassembled. The majority of M2s within ISOF service are of the older variety, rather than new models with a fixed headspace and timing. An M2 mounted on an ISOF HMWWV. Note the locally-fabricated armour of the turret. When behinf the weapon, the gunner will have his entire body protected from small arms threats. Also note the M249 inside the turret itself. This is a very common practice and appears to be where the M249 is stored when not being used in a dismounted role. It also provides a reserve automatic capability should the M2 malfunction. Many of the turrets to which HMGs are fitted have been locally-fabricated, featuring heavy armour plate with little standardisation. 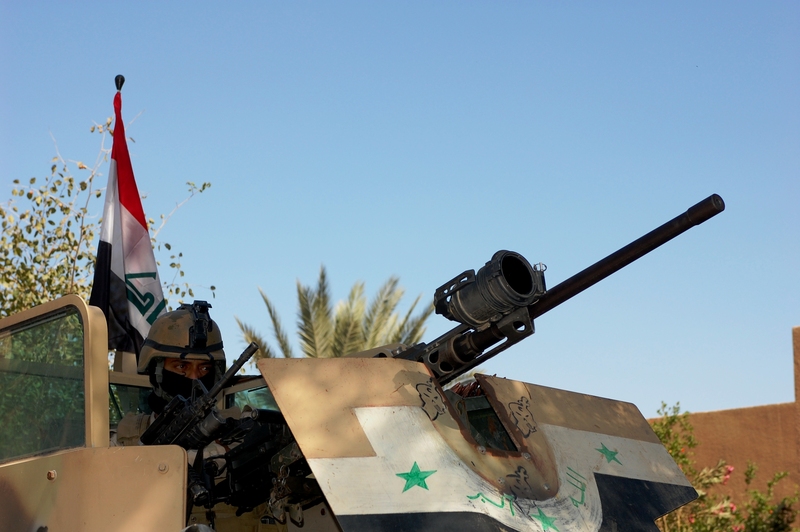 Different ISOF units often use entirely different turret configurations. Sometimes the armoured turret is almost 4 feet tall, effectively creating a bunker from which the gunners can shoot. Not only are these hard to rotate, but they dramatically move the vehicle’s centre of gravity upwards, increasing the chance of a rollover. 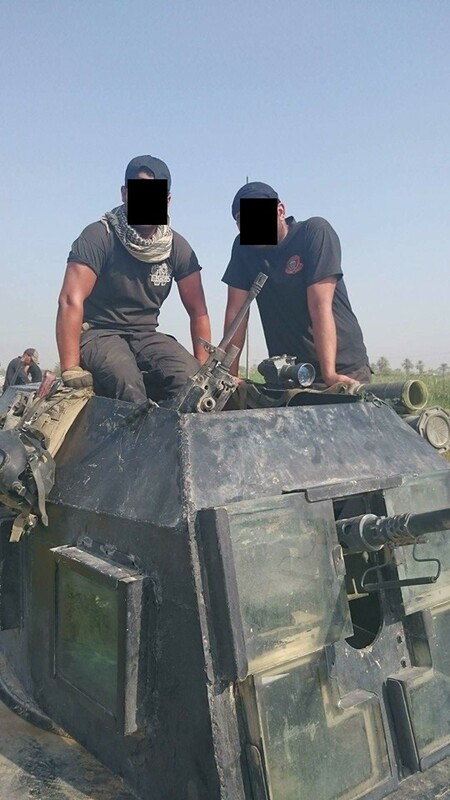 The US versions of these armoured vehicles have much slimmer designs due to the advanced materials used in their construction, while the Iraqi versions are limited to what can be locally produced and fitted. Part of the reason for this application of substantial armour plate is the true 360-degree nature of the threat posed by insurgent forces in cities such as Mosul, where attacks could come from any angle not only at ground level, but from upper stories and rooftops as well. Another locally-fabricated turret design. Note the substantial differences from the previous photo, representative of the minimal standardisation between the vehicles in the ISOF fleet. This gunner wears a non-standard fleece jacket under his plate carrier due to the cold weather and has a flashlight in his vest, quick at hand should he need to clear a malfunction at night. Although there are a few .50 BMG cartridge cases scattered throughout his turret, there is a much larger pile of smaller-calibre cases to the left of the M2, indicating that the gunner may have transitioned to the M249 that is also in the turret (note belt box, centre right, and the belt of ammunition at the lower right). 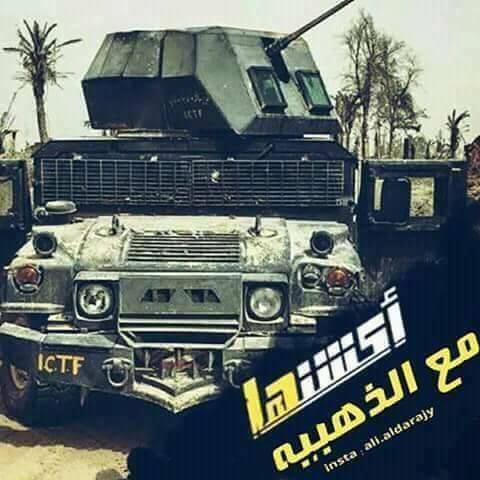 Note the turret of the HMWWV in front of this vehicle are painted with the letters “DI-A” which would form part of the word “DIYLA”, for the Diyla-based ISOF battalion. There are a limited number of Eastern Bloc machine guns in service throughout ISOF forces, although NATO calibre weapons far outnumber these. Of primary note are the aforementioned DShKM type HMGs mounted in some HMMWVs, as well as a handful of 7.62 x 54R mm PK and PKM type GPMGs mounted on troop-carrying HMMWVs or carried in the dismounted role. Most of these examples were seen in the earlier part of the fight against IS forces; as ammunition became easier to acquire from Coalition forces, these were largely phased out. If this ISOF operator needs to, he can easily dismount his PK or PKM type GPMG and use it in the dismounted role. Note the holstered handgun at his side, ARES observed a lot more frequently in the pre-Mosul operations against IS. The vehicle is a pickup truck that has been retrofitted with an armoured ‘cage’. 12-gauge shotgun shells, visible here, were often carried as a sort of status symbol that set ISOF apart from the regular Iraqi Army. PKM and DShKM type machine guns in service with ISOF units. Notice the lighter colour of the HMMWVs in this photograph, something seen commonly early in the unit’s history; almost all vehicles are now painted black. 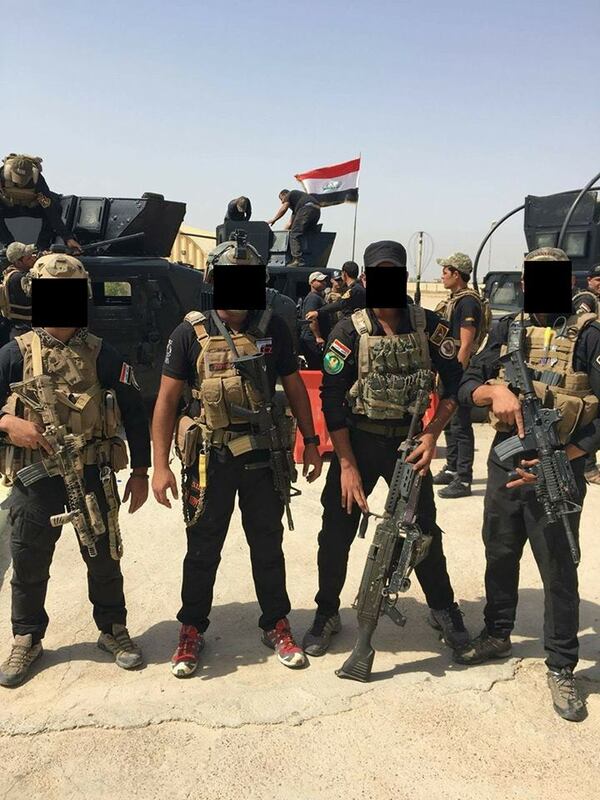 Also notice the painted web gear that the ISOF operators are wearing, also a sign of an earlier ISOF trend. This unit would most likely have been supplied with NATO calibre machine guns later in the campaign. Note on image sources: ISOF and other Iraqi social media and news aggregator sources via ARES CONMAT; and U.S. Defense Video Imagery Distribution System. Miles Vining is a Research Assistant with ARES and runs Silah Report, a website focused on the small arms and light weapons of the MENA and Central Asia regions.